A loan from us empowers you to finance a car you’ll love driving, new or used. Give us a call today. At Penn East, we've got extensive experience setting up customers with competitive auto loans. People come to us because we have a proven track record of reliability and affordability. Plus, we're easy to work with. We handle all applications ourselves and fund most loans on the same day. Not crazy about your current deal? We also cover refinancing. In fact, if you come to us to refinance your auto loan, we may be able to reduce your rate by .25% and give you up to $100 at closing. "They went over and above to help me when I took out a car loan. They were certainly there to help. Wonderful!" It only takes about five minutes to complete one of our applications. Reach out today and we'll get you started. 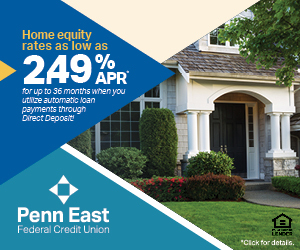 *APR= Annual Percentage Rate. The Annual Percentage Rate is the advertised rate and can vary based on creditworthiness, age of vehicle and terms of the loan.